Are you ready for the richest, chewiest, most mouthwatering brownies of your life? I hope so because I’ve got a brownie recipe to die for! Meet your newest chocolatey addiction: Easter Egg Brownies. Who knew that adding a chocolate Easter egg to brownie batter could create absolute perfection?! I bought four different kinds of Cadbury Easter Eggs. The Easter bunny will leave some out, but I also wanted to use them in a couple recipes. I bought the traditional Cadbury Creme Eggs and tried a few new kinds (to me anyways), Oreo, Fudgeeo and Caramilk. I used all four in this recipe to keep things exciting. They all look the same on the outside so you won’t know which flavour you have till you take a bite. Surprises make them even more fun to eat. 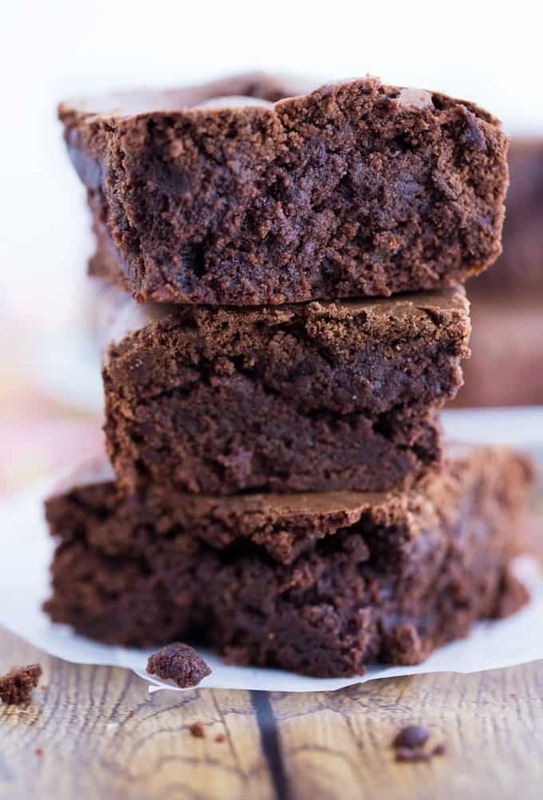 These brownies are from scratch, but you could also use a boxed mix to save on time. After you’ve poured the brownie mixture into your pan, you’ll embed the nine Easter Eggs in the mixture. I pushed mine down slightly with the back of a spoon so just the top portion is peeking out. I used nine Easter Eggs in the recipe and cut them into nine huge squares. I probably could have fit four across and then been able to cut them into smaller portions, but I only had nine Easter Eggs to work with. Feel free to add more (or less). The baking time won’t change. Easter is coming up fast so go out and grab a bunch of Easter Eggs while you can! If you want to be frugal, wait till after Easter and then head to the stores when all the Easter products are sold for deep discounts. I’m going to do that so I can stock up and make these treats again. 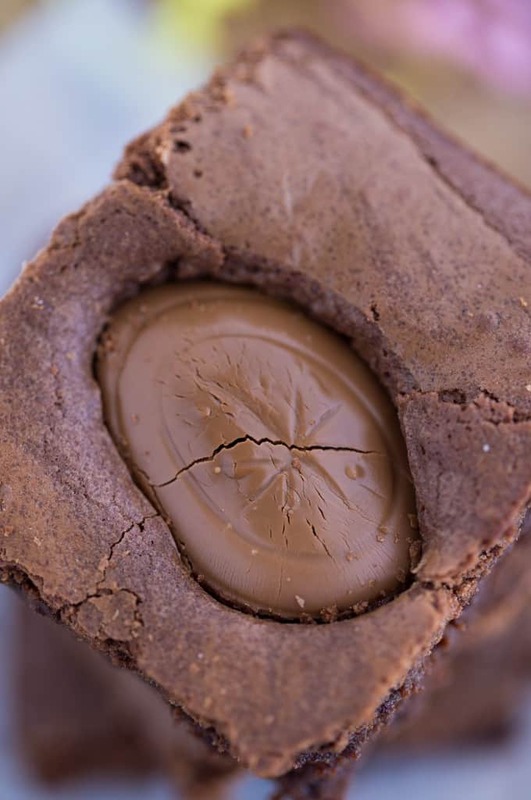 Add a few different kinds of Cadbury Easter Eggs to your brownies. You won’t know which flavour you have till you bite in! For more Easter inspiration, check out my Easter Pinterest board and Easter Desserts Pinterest board. Have you ever used Cadbury Easter Eggs in a recipe? 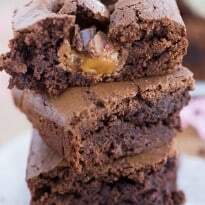 Meet the richest, chewiest, most mouthwatering brownies of your life! Who knew adding a Cadbury Easter Egg could create such a mouthwatering masterpiece. Melt chocolate and butter in a saucepan over low heat, stirring constantly. Once melted, remove from heat and let sit for 5 minutes. In a large mixing bowl, beat sugar, eggs and vanilla on medium-high speed for five minutes. Pour in chocolate and beat on low speed until combined. Beat in flour until mixed. Pour mixture into pan. Place Easter Eggs evenly into the brownie mixture. Gently press down with the back of a spoon to make sure it’s partially embedded. Bake for 40 minutes. Remove from oven and cool completely on a wire rack (about two hours). Cut into squares and enjoy! These are easy to make and look so delicious! I like the Cadbury egg in the middle for a nice surprise. I need to make these. I love so many of your recipes! Thanks for another awesome one! Oh. My. Gosh. These sound and look so great! I must try them! Thanks for the fabulous recipe! 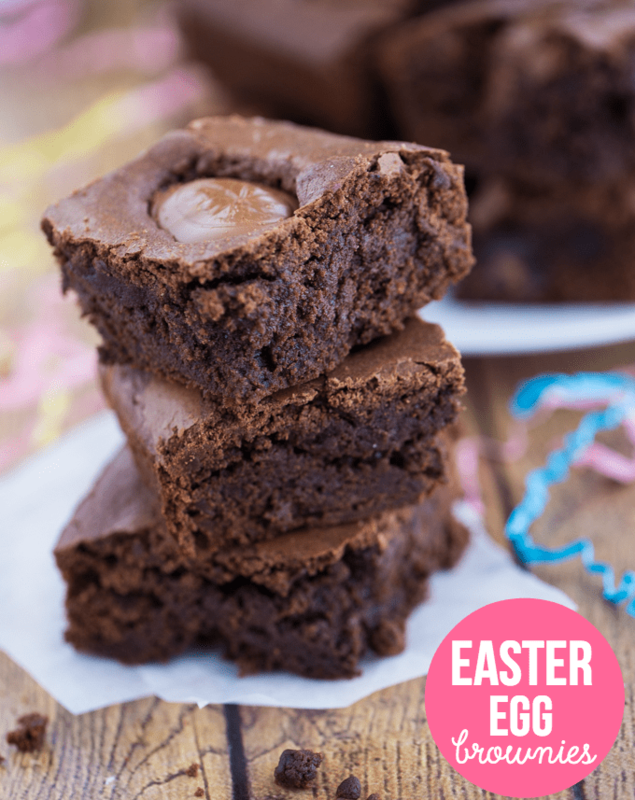 These Easter egg brownies look sublime.I want to eat them right off the page.I guess I better get baking some. Totally Yummy! Thanks for sharing! Love anything brownie so these are up my (Easter) alley! Visiting from Tutorials & Tips. We love brownies any way we male them. Thoa recipe looks so yummy and fun to make. Oh my! I don’t think I need to save this recipe…very dangerous! LOL! These look soooo good! Visiting from Wonderful Wednesday Blog Hop. This is a fun way to dress up my favorite brownies for Easter! What a fun idea for Easter, a great treat in a yummy brownie. Thanks for the yummy recipe! I’m making the chocolate Easter Egg brownies to go with my Easter dinner. I think I am going to decorate a little with white icing around the edges of the top of the egg just to fancy them up a little. 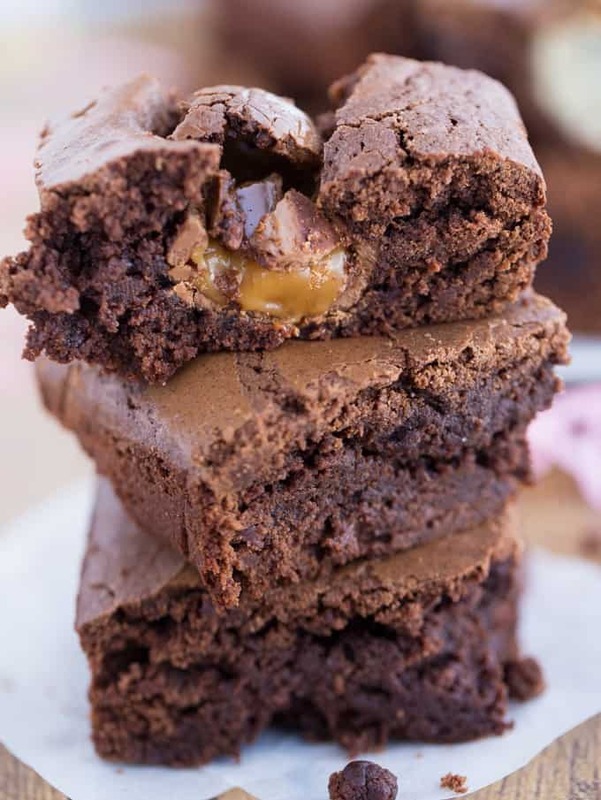 We love brownies, and with Cadbury chocolate eggs! I can’t wait to try these. Pingback: Easy Easter Cakes, Cupcakes, and Cake Pops!